Valerie Dean O’Loughlin is a Professor of Anatomy at Indiana University School of Medicine (IUSM), where she teaches human gross anatomy to medical students, basic human anatomy to undergraduates, and human anatomy for medical imaging evaluation to undergraduate and graduate students. She also teaches a pedagogical methods course and mentors MS and PhD students pursuing anatomy education research. She is a President Emeritus of the Human Anatomy and Physiology Society (HAPS). She received the AAA Basmajian Award for excellence in teaching gross anatomy and outstanding accomplishments in scholarship in education. She received numerous teaching awards from IUSM including the Scholar Educator award, which recognizes a single faculty member who approaches teaching through a scholarly lens. She also received the 2018 AAA Henry Gray Distinguished Educator Award for excellence in human anatomy education. Valerie is co-author of two textbooks: McKinley/O’Loughlin/Pennefather-O’Brien: Human Anatomy, 5th edition and McKinley/O’Loughlin/Bidle: Anatomy & Physiology: An Integrative Approach, 3rd edition. HAPS Midyear meeting – where, when, and why? Planning for HAPS 2014 requires a midyear meeting of the HAPS leadership in 2013! One of my jobs as HAPS President to plan the agenda for the HAPS Midyear meeting. This meeting is an opportunity for the Board of Directors (BOD)and the Steering Committee (SC) to meet face-to-face to discuss HAPS business. We typically meet in mid-October over the weekend, and the agenda is packed. The location of the meetings varies, but we typically try to hold the meeting in the same city and hotel that the next HAPS annual conference will be. This gives the leadership an opportunity to ‘check out’ our conference locations and do additional planning for the upcoming annual conference. So, this year, we are traveling down to Jacksonville and staying at the Hyatt Regency Jacksonville Riverfront. Our meeting is this weekend, and I leave for the trip tomorrow (if i forget to pack anything important for the trip, I blame waiting until the last minute to write this blog entry). The BOD members arrive Thursday evening in preparation for our all-day meeting on Friday. By Friday evening, most of the Steering committee arrives. Then, on Saturday, the Board and Steering Committee meet all day to finalize additional business before we leave for home on Sunday. ‘Why do you all need to meet face to face?’ you ask? Both the BOD and SC each have monthly e-meetings, where we use an asynchronous discussion forum to discuss HAPS business. In addition, the BOD has a monthly conference call to continue discussing the items brought up in our e-meetings. We get a lot of stuff done during these e-meetings and conference calls, but these formats have their limitations. There is some business that simply needs to be discussed face-to-face, or over a longer time than a typical conference call lasts. Our ‘physical’ meetings can be much more productive than our ‘virtual’ meetings because we are able to focus on HAPS (instead of our teaching responsibilities, family duties and upcoming deadlines). Some of the business we discuss includes continued planning for the annual conference, HAPS-I course development, finalizing and approving the organization’s yearly budget, and brainstorming the future of the organization. The midyear meeting gives us a chance to reconnect and remember what makes HAPS so special – it is the long-term friendships with each other and our shared commitment to excellence in A&P education. After our meetings, we get together for dinner and share a laugh or two (or 100). I always leave a midyear meeting feeling like I left my 2nd family, and am energized to take HAPS to its next level. So when people ask me why I volunteered for HAPS leadership positions and ran for President, these are some of the reasons why – I get to be a part of the growth and development of an organization I love, and do this with people I consider my second family. 🙂 It is a tough job, but one of the most rewarding jobs I’ve had! Why would I attempt to do this, when i have a bunch of other items on my plate? for starters, see the above sentence. 🙂 But more seriously, there is a growing body of research that indicates flipping the classroom improves student learning and outcomes. There are always a small group of students that struggle with the material – and if this is a way to reach those students, then why NOT try this? Also, I HATE a pure lecture environment where I am droning on and the students are struggling to stay awake. As much as I would like to think I am the most fascinating person they have heard, let’s face it – there is not a lot of engagement going on this way. In the past, I had created some interactive learning activities that we would do in the classroom (you can check them out and steal them for yourself here – click on the exam links to get to the various exercises). These are modifications of Classroom Assessment Techniques (or CATs, as penned by Angelo and Cross) and I would do these in the class at various times for students to test their learning. I love to use these, but I noticed that in a traditional lecture format, I always seemed to run out of time before I could do as many of these as I wanted to. So – this semester began the flipping of the classroom. Now unlike Wendy and Elaine (who are true transforming agents), I am taking ‘baby steps’ in this flipping approach. For each major lecture topic, I create a 10 minute podcast that students have to watch prior to class. (I create those in a program called Camtasia, which is SUPER easy to use and is not that expensive). I also encourage students to use the McGraw-Hill LearnSmart learning activities prior to coming to class (full disclosure: I am a McGraw-Hill author. Please note that other publishers have other wonderful accessory learning activities you could have your students use). In class, I now have extra time to do some of the learning activities I’ve linked to above, and/or I’ve planned other interactive activities in class to reinforce concepts (such as pulling up slides from the students’ virtual microscope and having them get into groups to discuss). How many of these plates can I keep from crashing down on my head? Am I still ‘lecturing’? Yes, and more so than a typical ‘flipped’ classroom would. but remember – I am taking baby steps here. 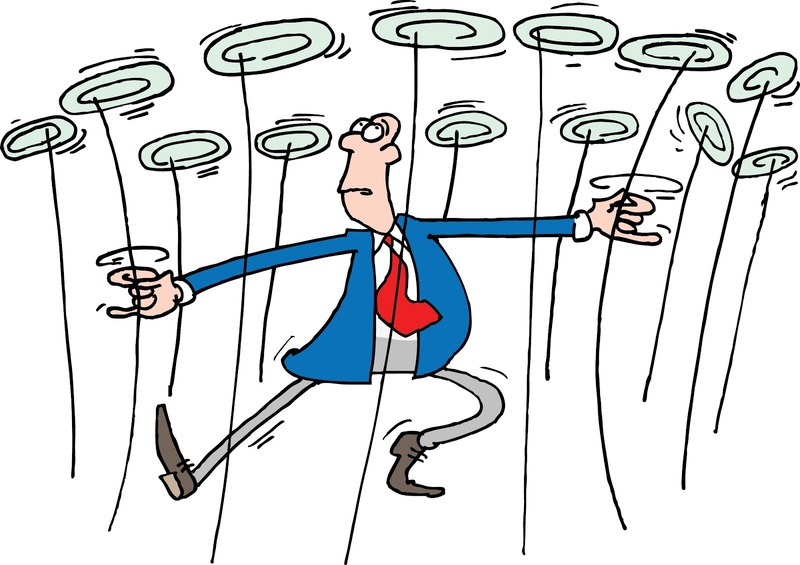 I knew there was only so much I could do this fall with my other HAPS responsibilities and not have all of the spinning plates come crashing down upon me. I’ll keep you posted about my ‘baby steps’, while Wendy and Elaine discuss their true transformations! For many of you, July 1st may not have been any big deal. It may have meant you were one day closer to your 4th of July weekend. Perhaps it was the start of your schools fiscal year, and that miniscule raise the administration had been promising everyone finally came to fruition. Maybe you remembered you had a car payment to make. Perhaps the worst U.S. President ever. but at least he got a stamp. For me, July 1st meant the official ‘start’ to my term as President of HAPS. Gulp. As President-elect, I spent the last year participating in HAPS Board meetings, taking on additional responsibilities, and learning more about the workings of the organization. This past year was very helpful for me to learn more about what a good president does and how a good president leads (thanks, Dee!). Now that it is my time to lead this organization that I hold near and dear to my heart, my thoughts are “Gee, I hope I don’t screw anything up!” Seriously. I really don’t want to go down as the president who destroyed HAPS. 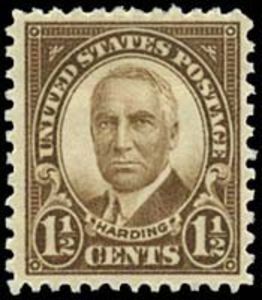 Will I become the Warren Harding or Calvin Coolidge of our organization? Have I just aged myself by mentioning Harding and Coolidge? Where did I put my keys? Where was I? Oh yes, the start of my term as HAPS President. As president, I have several goals for HAPS – the first of which is to not mess it up. 🙂 I also want to expand an educational research focus in our organization, both in our meetings and in our publications. I would like to get more of our HAPS members involved in regional and national meetings. We have over 1700 members, yet only about 400-500 members attend an annual meeting. This percentage is actually very good, compared to other organizations, but I want to see it get even better. Many of our members do not have the funds to travel to an annual meeting, which is why HAPS regional meetings are a great way for people to become involved. In addition, there are many A&P instructors who still have no idea about HAPS and what we can do to help them in their professional development, so we must do more to make these individuals aware of HAPS. Just as importantly, I want to ensure that the day-to-day operations of HAPS continue to go smoothly, and hopefully I will handle any crises in stride. 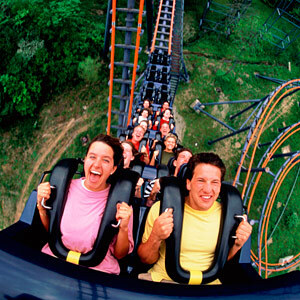 Buckle up your safety belts, and let the ride begin! Ready for… HAPS 2014? Tell us what you want! The HAPS 2013 annual conference in Las Vegas had record attendance, and preliminary member survey results indicate that most found the event informative and enjoyable. However, less than a month after the 2013 conference’s end, the HAPS leadership is making plans for the 2014 conference in Jacksonville, FL. The 2014 conference committee co-chairs, Steve Wood and Lourdes Norman-McKay, have already been working for a year on conference details. They’ve already been working with our Management Company and our Executive Director with respect to hotel selection, transportation to and from the school site, and overall organization of the conference. 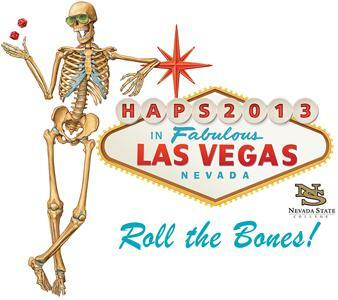 Well, less than a month after HAPS 2013 ended, discussion and planning for HAPS 2014 has sped up. This past week I joined the conversation as we all discussed some specifics, such as the number of rooms that needed to be reserved at the school, the specific social events that need to be planned, and finalizing update speakers. The host college for HAPS 2014! * In 2013, we implemented a HAPS social that was free to everyone (instead of a more formal banquet, that required an additional fee). Since we received a great positive response for the Social format, we will continue to hold a Social in 2014. It is exciting to see the development of the conference unfold! 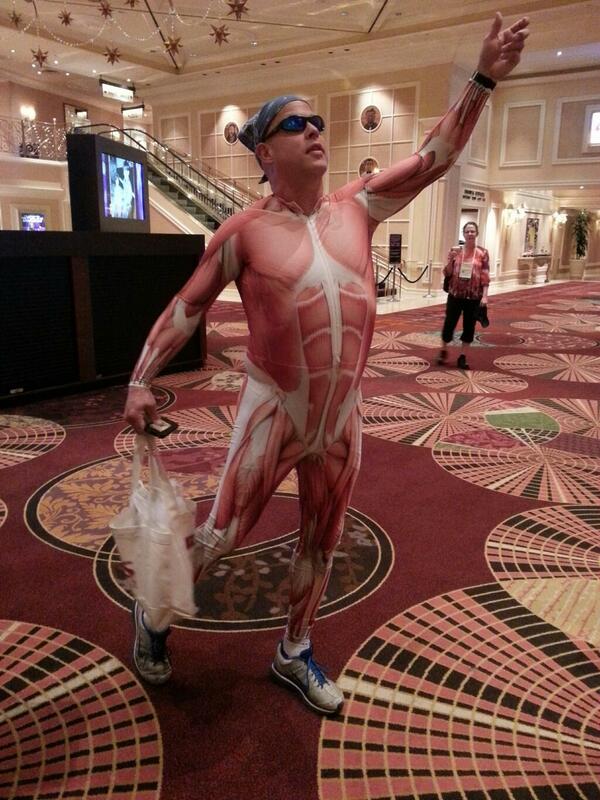 So please tell me – what do YOU want to see at HAPS 2014? What did you especially like from past conferences that you want to see continue? Is there anything new you’d like us to try? Comment on this post and let’s get this conversation started! 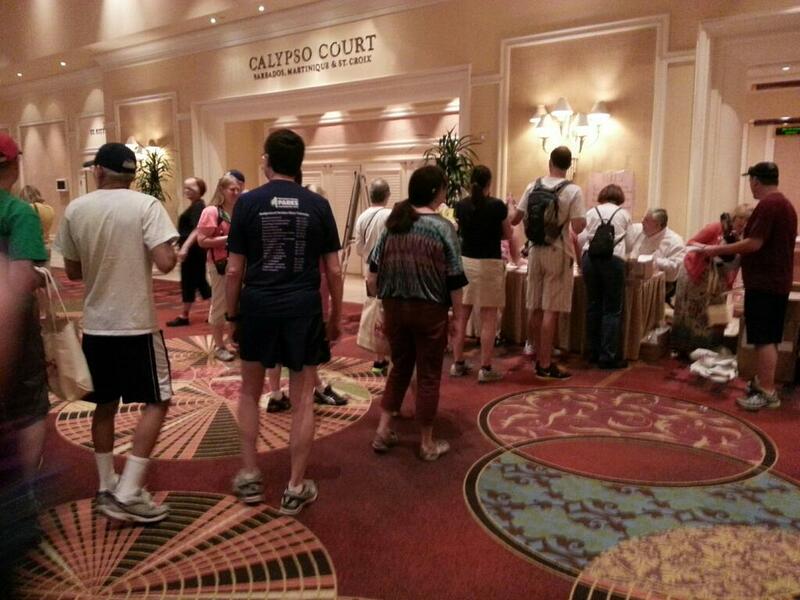 Look at all the registrants for the HAPS Poker Walk! Since this year’s meeting was in Las Vegas (which typically has temps of 100+ degrees at this time of year), we were concerned about having a regular run and potentially killing off our members. (As a general rule in organizations, it is not a good idea to cause bodily harm to your membership.) 🙂 Our current President Dee Silverthorn suggested we hold a Poker Walk instead, so members would not get overheated. What is a Poker Walk, you ask? Some more official rules may be found here, but a nice summary is that it is part walk, part scavenger hunt, topped off with a hand of poker. Participants start off at a central location and receive a poker chip and a clue to their next destination. They walk to the next destination where they will get another poker chip and a clue to the third destination. This repeats until the participants have collected 4 chips, and they return to the starting point. There they exchange their chips for a 5-card draw poker hand. For an additional donation, they may exchange one of their cards. The best poker hand(s) win prizes. 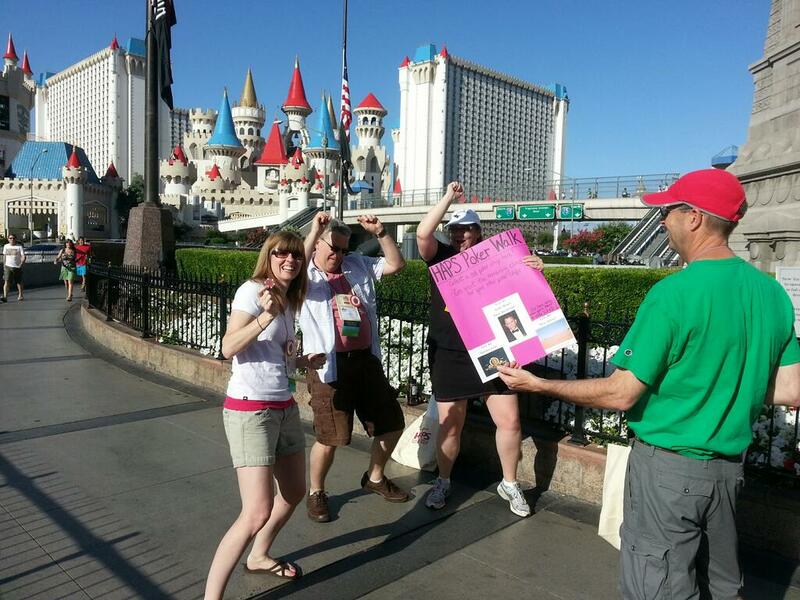 Poker Walk volunteers dance away for participants at the first destination. I was assisted in the planning of this event by Tom Lehman (Steering Committee chair and new President-Elect) and Bob Crocker (co-chair, Foundation Oversight Committee). The three of us were able to address various challenges in the planning and eventually came up with a route that wasn’t too terribly long and had easily identifiable landmarks. Multiple volunteers from the board, steering committee and membership got up extra early on Monday morning so they could staff the various locations. McGraw-Hill graciously donated water bottles to all participants and the annual conference committee had a variety of prizes to give both before and after the event. But the big question remained…. Would people get up early on Monday to participate in a walk at 7am? The answer was yes! We had over 60 people participate and engage in the fun. Volunteers at each station entertained the participants, and our final station dealt poker hands like card sharks. The annual conference committee had many prizes on hand so many participants walked away with a prize. Many people commented that they had a great time and would like to so this again. So next year, when our annual conference is in Jacksonville, be prepared for another similar event. While the event may not be a poker walk per se, it will be something that is fun, gets us moving, and helps the HAPS Foundation. Getting ready for HAPS 2013 Conference! In just a few short days, the HAPS 2013 Annual Conference will begin. Until I became active in HAPS leadership, I was blissfully unaware of all of the prep required months and years before the conference. Somehow everything magically fell into place each May, and I had a fantastic time at our annual event. I know better now. The annual conference would not come to be without conference organizers (HAPS members who volunteer to host the conference), their volunteers, and our wonderful management company, ASG. ASG employees Shanan and Robin do much of the ‘heavy lifting’ concerning scheduling a venue, arranging hospitality contracts, working with our vendors and exhibitors, handling registration, and ensuring all of the details fall into place. If you are coming to the conference, please take time out to thank them both for all of their hard work – they are irreplaceable! Our new Executive Director Peter has been phenomenal, working with ASG to make sure all goes smoothly at the meeting, and setting us up with our first HAPS meeting app. 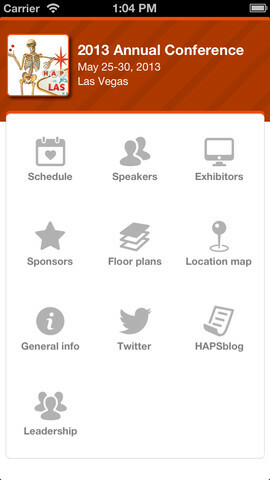 Be sure to go to Google Play or iTunes and download the HAPS 2013 app for the meeting! Our current HAPS president, Dee, has been working tirelessly with all of these individuals to make sure the annual conference goes smoothly. Since her first month as president, she has been in contact with all of the above individuals to make sure that all aspects of conference planning were in place. Dee was (and is) the ‘go to’ person whenever any of the above individuals had a question or an unresolved issue concerning the conference. Why all the fuss? Well, in addition to being a fabulous social and intellectual experience, the annual conference is the major event that keeps HAPS afloat. It is through the funds received from the conference that HAPS continues to exist and thrive. No annual conference – no HAPS. Simple as that. So when I begin my tenure as HAPS president, I hope to be as successful as Dee was with the conference organization. I am looking forward to working with the conference chairs for our 2014 annual conference. In the meantime, I hope to see all of you in Las Vegas beginning this weekend!